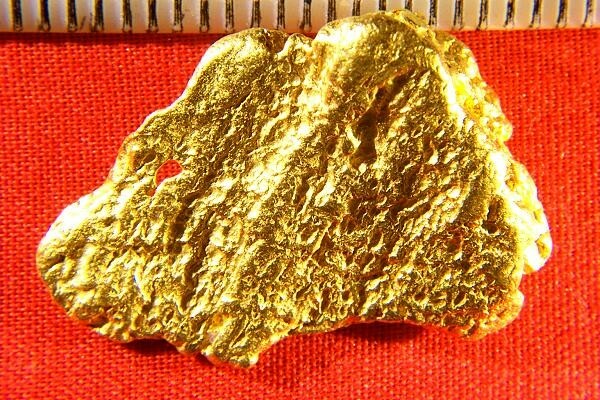 This Australian gold nugget is big and beautiful and rarer than rare. What makes it so rare? This nugget is very unique because it weighs 31.1 Grams (exactly one troy ounce). 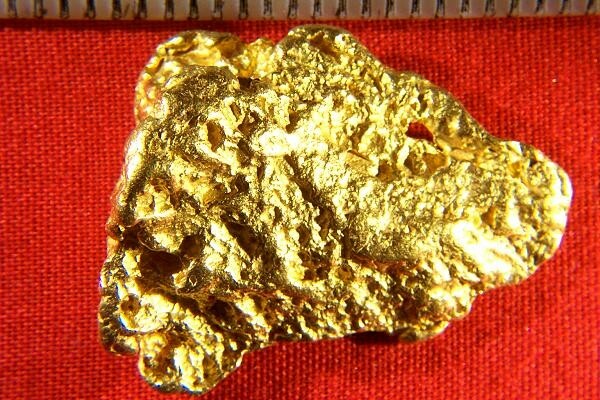 It is not very often that you find a natural gold nugget that weighs exactly one troy ounce, in fact I have only seen a couple nuggets in my lifetime that weighed exactly an ounce. You will probably never find another one like it, so it is priced for it's extreme rarity. It is a hand selected jewelry/investment grade gold nugget, the highest grade of natural gold nugget that you can buy. It also happens to be drop dead gorgeous, with incredible color, astounding briteness, and beautiful shape and lines. Perfect conversation piece to carry around or have a jeweler solder on a gold bail and hang it from your neck on a nice gold chain. It's a perfect shape for a pendant and your friends will be amazed. To be honest I'd be happy if it was the last nugget in my collection to sell, seeing as how it is one of my four current top favorites. It comes with a certificate of authenticity. Wow! Just held it in my hand and noticed that if you turn the top photo a bit to the right it looks like the head of a bear. It even has a natural hole in the nugget where the eye would be. Turn it in your hand on the other side and it resembles the head of a mountain lion. AWESOME! This amazing nugget just rocketed up to my second favorite nugget. The size of this rare beauty is 1.25" (31 mm) long x 1" (24 mm) wide. Whether you display it for it's beauty, make it into a gorgeous jewelery piece, or put it away as an investment, you will love the look and feel of this heavy gold nugget in your hand. It is 95% to 98% pure (22 KT to 23 KT).